When it comes to creative ideas, Jan Zuehlke and daughter, Lara, never seem to run short. Certainly, it's not everyday a mother and daughter team up to research and write a novel. 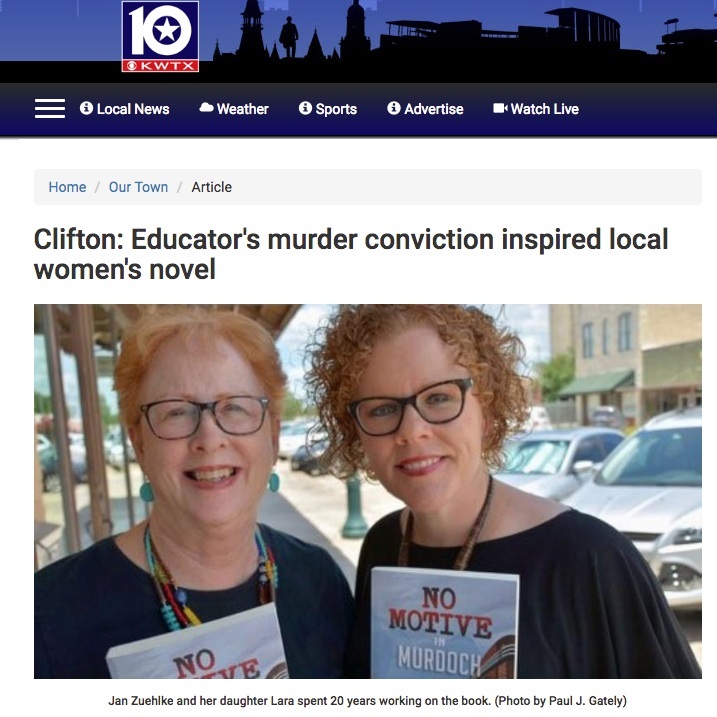 But the two began brainstorming years ago about how to draw from the true-crime events that took place in Clifton, Texas in 1985 to write a fiction novel. The result is a compelling page-turner centered around the universal story of overcoming tragedy, moving through grief, and forgiving the past. Readers from all backgrounds can relate to the challenges the book's main character, Julia Jarvis, faces as she tries to piece together her past to reclaim her future. Jan served as the primary researcher for No Motive in Murdoch, working closely to craft the characters and storyline. Over her more than 40-year career, Jan served as an educator, consultant, and college professor. She received her bachelor's from Sam Houston State University, master's from Baylor University, and a doctorate in educational leadership from Texas A&M University. Today, however, Jan much prefers the titles of "co-author" and "Granny." She and her husband, Lawrence, are retired in Clifton and enjoy keeping up with their four grandchildren and traveling in their fifth-wheel RV. An award-winning writer, Lara is no stranger to staring at blank pages or conquering writer’s block. Yet, unlike with writing projects in the past, the scenes for No Motive in Murdoch simply spilled out of her. Inspired by many brainstorms with her mom, Lara served as the primary writer and editor of the book. Over Lara's more than 20-year career, she's written for virtually every type of print and digital media. She lives in Austin where she can often be found cycling, practicing yoga, or sipping a Chilean Cabernet on a patio. Lara received a bachelor's in journalism from Texas A&M University. No Motive in Murdoch is a work of fiction. Names, characters, businesses, places, events, and incidents are either the products of the author’s imagination or used in a fictitious manner.